There are several ways to jack up an RV, but we favor lifting the wing at the tiedown point. It’s plenty strong enough. 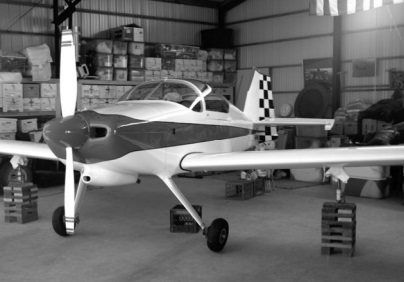 We lift one wing at time, which leaves the airplane (tri-gear or tailwheel) with three points supported – and a tripod is a pretty stable arrangement. Since most reasons for jacking the airplane involve working around the landing gear, wheels or brakes, it helps to have the jack out of the way. The wing must come up quite a ways to actually lift the wheel off the ground – the distance surprises many people when they try it for the first time. “In the past I had constructed a couple of el-cheapo jack stand/blocks out of 4×4, 2×4, and 2×6 lumber. They were simple cribbed stacks of scrap lumber sawn in about 14” lengths and nailed together. I’ve used them to hold my truck up during tire rotations so I knew they could hold a LOT of weight…significantly more than my RV-6. If I could somehow make them slightly higher, stabilize them, and mount a bottle jack on them, that would work! So down to Harbor Freight I went, and just happened to find two of their 1-ton bottle jacks on sale. Sweet! I then went about measuring how high the lumber stand with the bottle jack would need to be and began sawing up a few more pieces of scrap lumber. “It turns out that about 13 layers of 2” lumber (~20”) was about right. I nailed up the stack, then drilled two holes in the base of the jacks and secured them with couple of lag screws. I found a bolt that fit the threads of the wing tiedown and ground the hex head to a bullet shape. Most aircraft jack have a cupped recess at the business end of the shaft, but mine didn’t — just a flat face with a small hole in the middle. A couple minutes with a big countersink bit in a hand drill produced a divot big enough for the modified bolt head. 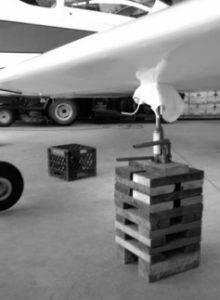 The resulting “ball-in-socket” arrangement is stable and allows relative movement as the jack extends and the wing rises. “A word about jacking the aircraft… “BE CAREFUL!” Before raising the 2-place RV series of aircraft, you must first securely anchor the tail down before raising the aircraft. Why? Since the Center of Gravity is most likely forward of the jack points, the aircraft will want to nose over. Draining or having minimum fuel onboard also helps make it lighter and moves the CG slightly aft. It’s probably wise not to have wind, kids, pets, earthquakes, distractions, etc. in the area when performing this work as it could have unexpected results.